The world’s best software arpeggiator! The world’s best software arpeggiator! This is how Arto Vaarala describe its arpeggiator “Cream”. And they do not lie! Unfortunately, and there is a big mistake, the functions are limited to one track. In-App purchase will allow you to work on more tracks. Application developers must make a choice! This does not question the quality of the application, but it is very disappointing for the user to have to buy options to take full advantage of an already purchased application, very often at a great price. 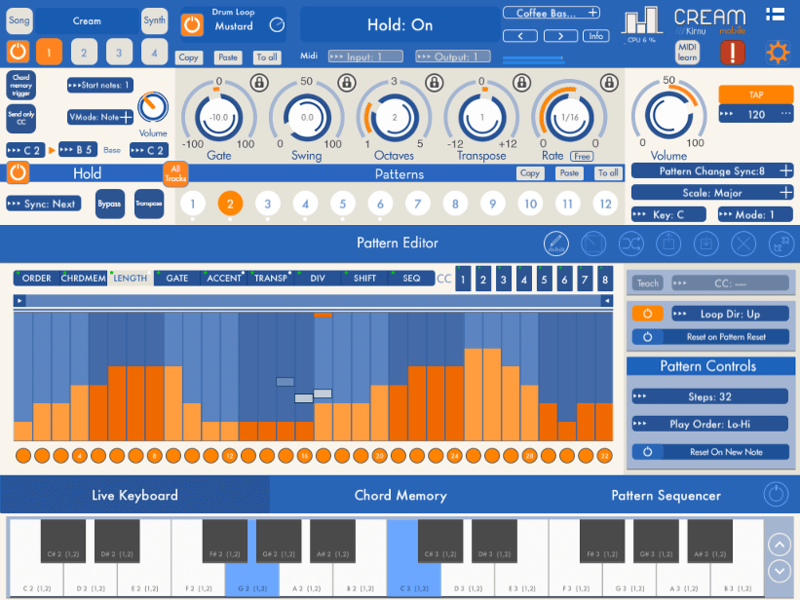 Kirnu Cream Mobile is a very powerful MIDI performer music application for iPad. This version is almost identical to the plugin version except the mobile version includes internal synthesizer and single drum track. Mobile version also has only one arpeggiator track by default. If needed, the rest three tracks can be purchased separately with in-app-purchase option. This version can open plugin version presets and vise versa. – Two different views: Classic and quick edit view. – Live Keyboard, Chord Memory and Pattern Sequencer sections. – Sample accurate MIDI engine. – Easy to use note hold mode with transpose and bypass functionality. – Presets are compatible with the plugin version. – Tool section enables easy data editing. – All data sections are independent from each other. – Data sections can be looped with several different loop modes. – Chord memory section enables different chords to be used in every step. – Sequencer section enables sequencing the notes. – Accent, order, gate, accent, transposition, note divide, note shift. – 8 CC controls in each pattern. – MIDI learn for all knob controls. – Control Zone for changing most important parameters via external keyboard or MIDI events. With Cream Mobile it’s very easy to create catching lead parts, bouncing bass lines, swinging drums and lots of other cool stuff. The only obstacle is your imagination. Cream Mobile isn’t like any traditional MIDI arpeggiator or sequencer. It’s a lot more. With simple and clever design it has been made easy to learn and operate. You can easily create cool performances by tweaking only couple of controls. If this is not enough for you there are so many ways you can control Cream that you never feel bored with it. Kirnu Cream is good for everybody; hobbyists, professionals, producers, composers, mamas, papas… whoever needs a good MIDI performer to make their songs PERFECT! If you are sick and tired of conventional MIDI arpeggiators, performers, sequencers you should try Cream and see yourself how it differs from the rest.